leading up to Sunday, April 30, 2006. 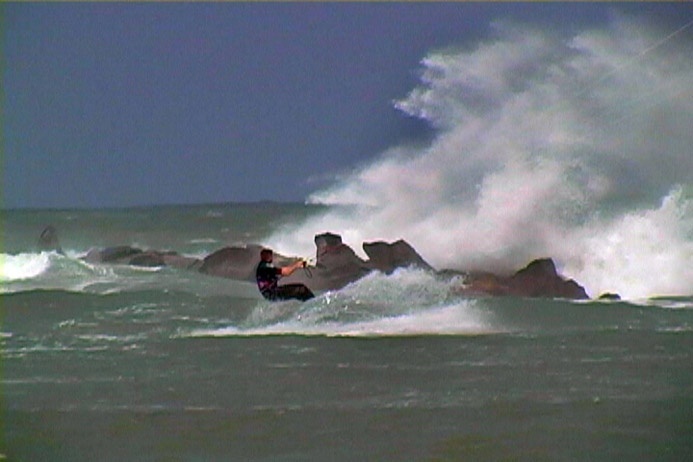 Ft. Pierce Inlet is famous for going off with big surf under such conditions. 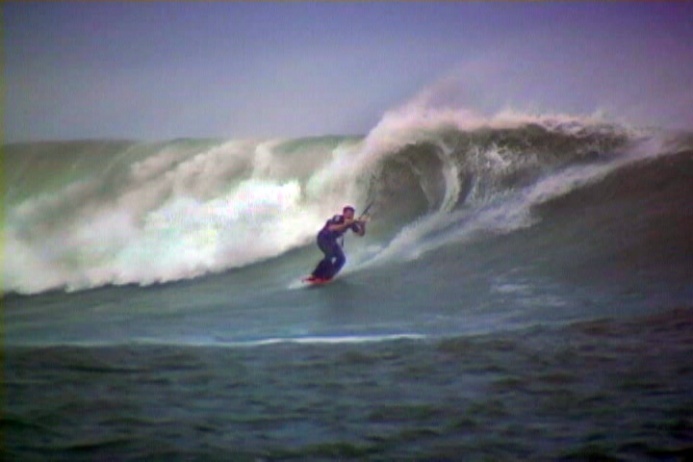 There were a bunch of riders out tearing it up in the surf and the calmer areas in the lee of the jetty to the south. mile from shore. 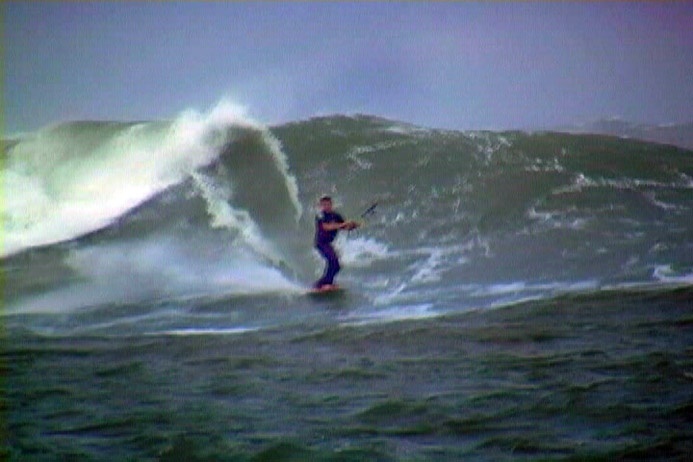 Ft. Pierce is an outstanding wave riding venue when the northerly winds cook off. It does get big out there around the end of the inlet jetties. GK having a blast in the heavy surf at the inlet. 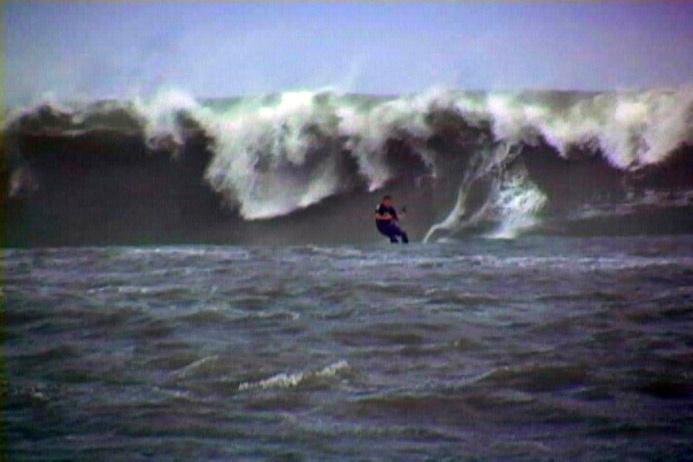 This photo and several big wave images to follow courtesy of George Saunders with http://kiteflix.com/ . Many of these images were captured from the DVD "Aerial Assault." Huron/Lake St Clair in the summer and in Florida in the winter. Doug has been a regular at Florida events for years. any event. 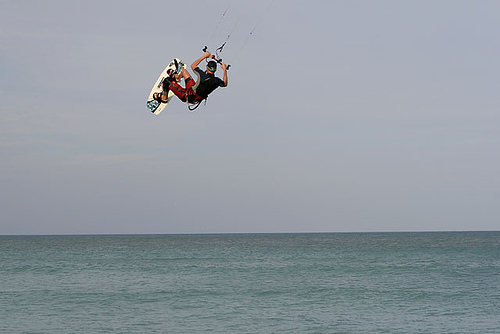 In addition to being sponsored by Cabrinha, Gebi has also been a rider for Dakine, for 25 years! outboard. The current then started to rush the boat stern first seaward into mounting seas. Doug was within 20 ft.
water. The guy and the two girls were in the water surrounded by floating debris, life jackets, gas tank, tool box, etc. hauling eastward with the rushing current. The girls were screaming, obviously a bit disturbed by developments. kiteboarders would be there to help soon. This is what the sunken boat and trio were drifting into fast! the guys have to sine their kites heavily just to try to gain ground. They were probably 300 ft. east of the jetties. current at which point they were able to turn to the west and head into the beach in the lee of the south jetty. his board for about 100 to 200 yards at a go. 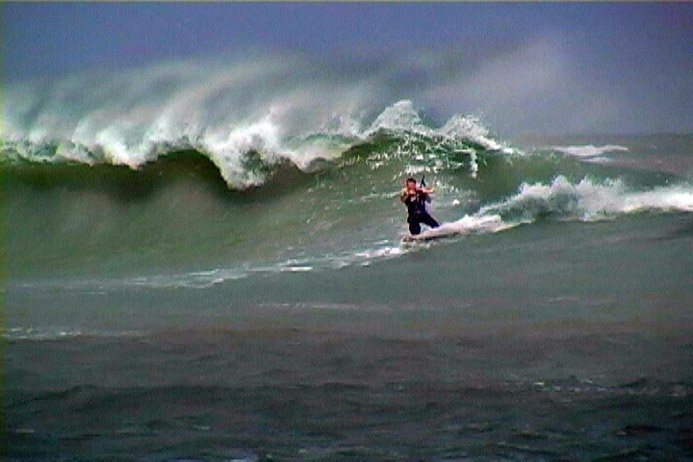 wave/current conditions at the inlet were "spooky" given how big things were running. and waterlogged but perhaps some miles from shore. The USCG was on the scene in about ten minutes. They have a base within a mile to the west of the inlet. in turn and headed back out for some more riding. The wind had regained some strength, so why not? The seas were too heavy for the USCG to do much with the boat. I understand it beached some miles to the south. easily through them, even more so than some rescue craft. This is not the first nor the last kiter rescue. p.s. - HAPPY BIRTHDAY DAVE! Hope you received at least a tenth as much as you gave. Thanks guys. Last edited by RickI; 08-22-2007 at 08:01 AM. example appears as that black ropey thing in the photo below. Still have questions? Just ask away. Way to go, Uncle Doug!! Gebi and Dave too!! Hey guys, really interesting posts. I'm not nearly skilled enough to do anything like this at the moment, but would anyone be willing to post some basic how to's on dragging someone in along with some tips for safety in this type of operation? I would say continue to work on kite handling, board skills and just becoming at home with your gear and in a variety of conditions. In the interim, you could do a lot by giving the person assurance, making sure they are floating OK (with a life jacket, etc. ), noting where they are and approximate drift and considering running into shore and asking someone to send help out. Alternatively, the best call may be to stay with them making an easier to see target and wait for help to arrive. Every situation is different and needs to be considered on its own merits. Important, talk with them from a distance, making sure they understand what you wish to do and are rational. Panicked victims can effectively drown rescuers if things go poorly. actively rescue only when safe to do so." Once you are more at ease with your gear, your options will become better known to you almost naturally. It is best to study a situation before engaging in it to try to plan around difficulties and not inadvertently make things worse for them or yourself. 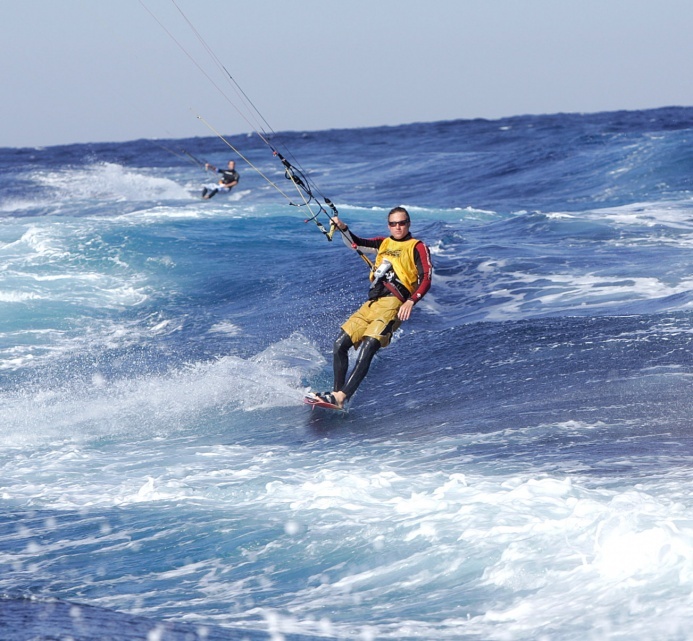 The wind speed, direction, wave and current conditions, how much kite power you have to use and where you need to take your passenger should factor into your analysis. You might be able to make good speed on your own body dragging but with the added weight and drag of a passenger you may not. 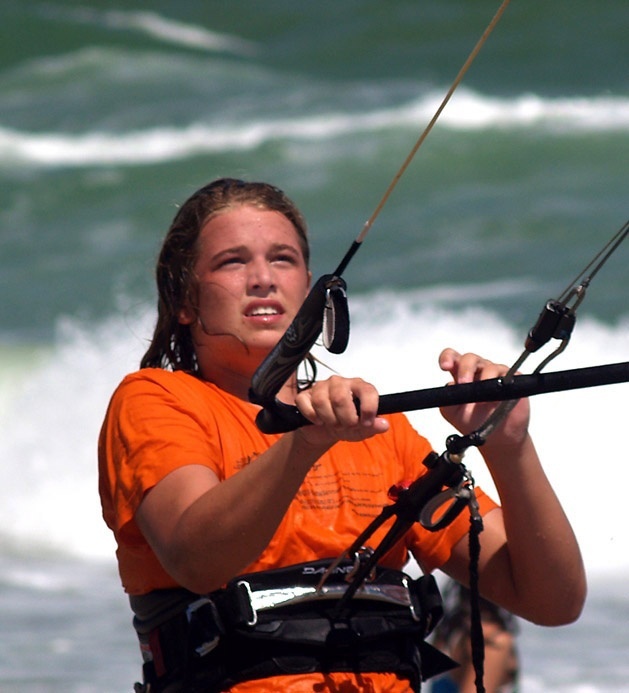 You don't want to lose control of your kite and have it go down in the middle of things either. Nearby inlets, adverse currents, changing seas all should be considered if applicable. I usually carry about a 20 ft. section of 1/8 inch nylon line in my impact vest. It makes setting up to tow people fairly easily. Most of the time, you may not be able to get up on a plane like Gebi. Having a light girl and Olympic background can help along having done tandem runs before. Most of the time you will be stuck body dragging like Doug did. I hadn't thought of keeping my board on my feet and dragging in that fashion. That very likely saved him from losing his board. Still, keeping the board adds a lot of drag, costs speed and ability to ride closer to the wind if necessary. A lot of this comes down to choices. If you do manage to keep your board and if it is safe to leave your charge, e.g. they have a life jacket, you might even have the option of riding into shore for help at speed if necessary. Dave had an easier time because his guy already was on a surfboard AND he had a tow point. Normally you want a tow line at least ten feet long to keep them from hammering into you. I recall Dave telling me he was getting slammed by the guys board at one point. So, carrying a thin towline can pay dividends. 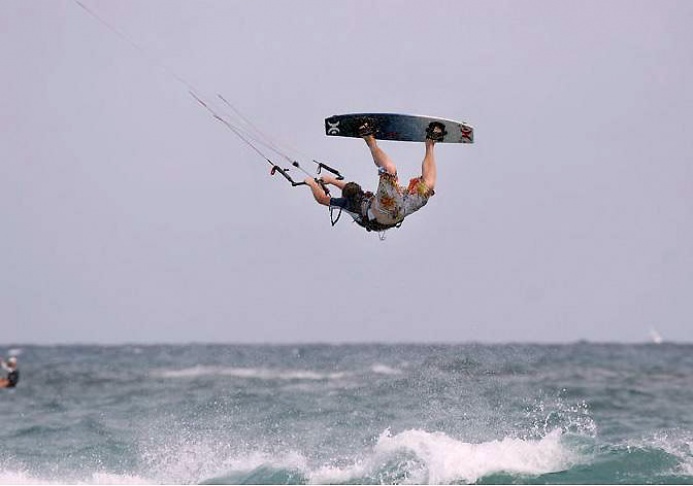 Kiteboarders are sometimes adept watermen. Thinking the problem through, having some minor aids along and then acting for effect can make a difference for some poor soul and add to a kiters day. It also gives me something interesting to write about! Rick, Did you know ? ? ? That Steve Schafer took the two pictures of me, (Doug Smith), that you used in this story, earlier that year, at a place called Hermans Bay which is located Mid Hutchinson Island, Florida, just south of the FP&L Nuclear Power Plant on the Atlantic side in a 20~30 mph West Southwest straight off shore wind. It is a very narrow, one mile or so strip on the island that was almost striped clean of trees and their leaves by the 2004 Hurricane Season. 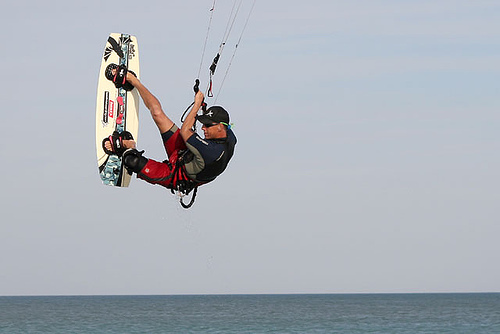 No one had ever tried kiteboarding there because it breaks some kiteboarding safety rules, but we had been thinking about the Flat Water / Clean Wave Possibilities and it turned out to be a Great Idea and Fun Photo Shoot as we took turns on and off the water. The sad thing is I never got to see what we took of him there that day ! Great Memories ! ! ! He will be missed greatly by all who knew him !